The names of Captain America and Steve Rodgers will no longer be synonymous. Marvel Chief Creative Officer Joe Quesada announced Wednesday night on The Colbert Report that Sam Wilson, better known as Falcon in the Marvel Universe, will be taking up the mantle (or shield) of the great American hero. This is Marvel’s second big announcement this week, after revealing on The View that Thor will now be a woman. The news comes after the latest issue of Captain America (2012), in which Steve Rodgers’ super soldier serum is sucked out of his body. This triggers Rodgers to rapidly age, leaving him unable to wield his iconic shield. But don’t think that the old Cap’ is down and out for the count, according to Marvel editor Tom Brevoort Steve will serve as Sam Wilson’s strategic advisor. Sam Wilson (aka Falcon) will becone the new Captain America. Other Marvel characters have carried the famous shield, but this is the first time that a black character has officially taken on the role of Captain America. 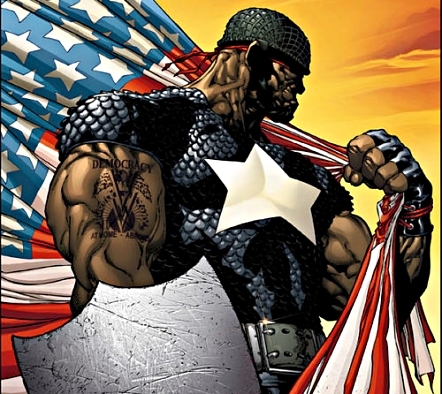 However, Sam Wilson isn’t the first Captain America of African American descent. According to BuzzFeed, Isaiah Bradley, who underwentrigorous super soldier training during WWII, is considered by some to be the first black Captain. Isaiah Bradley is considered by some to be the first black Captain America. Sam Wilson’s debut as Captain America is set for this fall in ALL-NEW CAPTAIN AMERICA. In other news, the role of Falcon is now open, which could possibly be filled by Stephen Colbert.